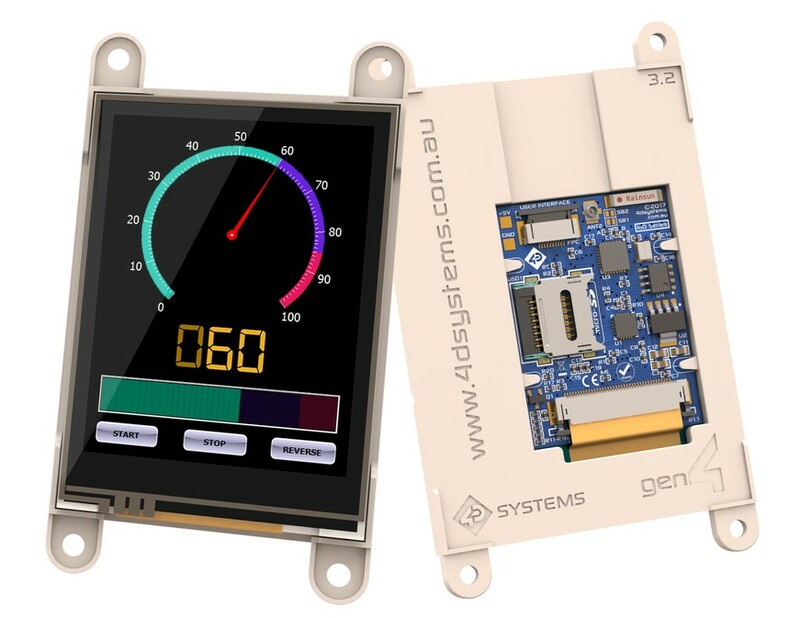 Sydney, Australia and Nuremberg, Germany: 4D Systems has introduced the gen4 Internet of Displays (IoD) series of intelligent display modules with resistive touch. With their integrated WiFi capabilities, the display modules allow users to quickly and easily create GUI (graphical user interface) applications with wireless connectivity. Three sizes are available initially, the 2.4” gen4-IoD-24T, the 2.8” gen4-IoD-28T, and the 3.2” gen4-IoD-32T. All feature a 240 x 320 pixel display with resistive touch and integrated WiFi. An ever increasing number of devices are connected to the Internet these days and an equally increasing number of devices are expected to have GUIs with touch screen functionality. 4D Systems’ gen4 IoD series provides a fast way to implement a GUI with wireless connectivity to almost any device needing such a facility. The display modules are aimed at manufacturers and enthusiasts who need a quick and easy-to-use professional solution for wireless GUI applications. Applications wise they are aimed at any wireless application requiring a GUI to display information from sensors, or to control devices and/or sensors using a touch screen. Powered by an ESP8266 SoC device, the modules are able to handle very demanding levels of graphics functionality, and with wireless connectivity they are able to connect and communicate with cloud data and other devices on the web. An on-board SD card socket enables the use of FAT16 or FAT32 formatted cards for extensive storage capabilities. The display modules provide the ability to design a GUI using Workshop4 IDE or Arduino IDE software. This enables simple drag and drop type programming, and eliminates the need to perform traditional coding. Further benefits of this feature are the vast amounts of examples available online, thus ‘kick-starting’ application development, providing access to excellent, widely available documentation, and faster prototyping and time to market. As an all-in-one implementation of display, processor and touch screen, the gen4 IoD display modules provide everything required for a wireless GUI application in one small, pro quality package. There is no need to source components from multiple sources, saving time and BOM costs. The modules utilise proprietary, patent pending manufacturing processes that provide for exceptional cost savings - and thus an unbeatable price - yet an uncompromised build quality. In normal use the modules can be fitted into very small end user application enclosures. Alternatively, the slim and sleek design of the gen4 series means that application boards can sit flush at the back of the module allowing for very compact end user applications. At the core of the IoD series display modules is 4D Systems’ main software development tool – 4D Workshop4 IDE. This development environment provides users with the possibility to quickly develop GUIs for embedded displays with minimal coding requirements. Users can see what they are developing during the development process, and the software takes care of most of the coding for the graphics. Users can focus on designing the application rather than worrying about the low-level design. 4D Systems’ display modules are truly unique in the marketplace. No other product combines codeless programming, connectivity, integrated display with touch screen, vast amounts of community shared examples, professional quality and support, and documentation at their price point. The only other way to achieve this level of performance is by paying a much higher price for a more powerful alternative platform. In terms of ease of use, integration, development time, quality and price, 4D Systems’ gen4 IoD display modules provide the best wireless display solution for cloud and internet of things applications.